I’ve recently developed a craving for sweet food. This craving rears its head at the strangest of times and more often than not, behaves like that puppy determined to chew on your favourite shoe. And it’s nowhere cute because indulging this craving leads to a sugar overload, late-r nights and blurry-eyed mornings. Let’s not even mention the not-so-good effects of refined sugar if I’ve fallen prey to store-bought mithai* or those glistening chocolate éclairs. It happens often. Very, very often. This new craving has also turned into a major topic of discussion at the dining table. The parents stand divided with their concern. They indulge their sweet tooth, courtesy yours truly. They always have sweets to offer to friends who pop in. They don’t feel guilty about buying the sweets. Concerns about the usual diabetes and cholesterol issues abound amid worries over the varying waistline owing to the sweet tooth and crazy hormones. 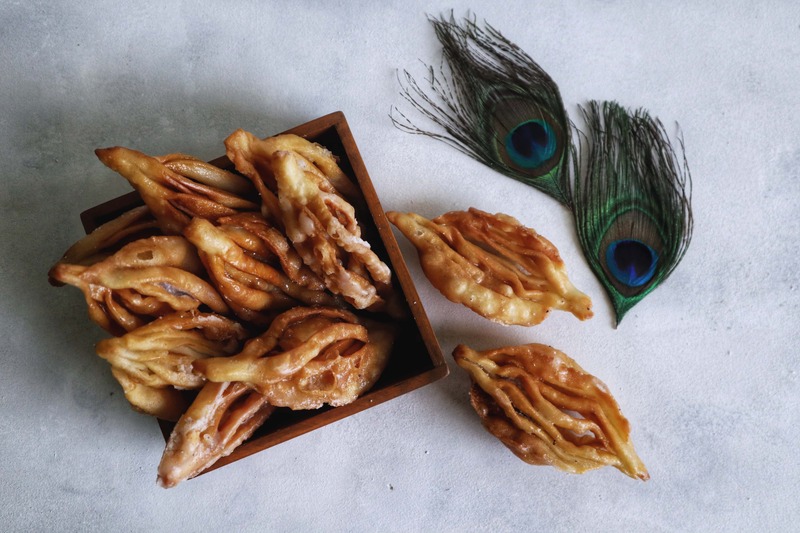 The cons of the sweet tooth being more ‘sordid’ as compared to the fun parts of the indulgence has led to Maa coming up with the brilliant idea of ‘homemade sweets’. “How about I teach you easy Bengali sweets that your dida* made back when I was a kid,” she suggested. My father perked up at the idea and quickly got down to the serious business of listing homemade Bengali mishti* he’d gorged on as a kid running wild through the village streets. Maa perused the list and simply said, “Elo jhelo”. So what is this elo jhelo? It’s a fried pastry dipped in sugar syrup and served after the syrup has dried, giving a sweet and crispy texture. No one knows – or at least no one in my family knows – the history behind the crazy name ‘elo jhelo’. If any of you do, please enlighten me! As Maa mentioned, this was also among the sweet dishes that my grandmothers made during the Bijoya greetings season post Durga Pujo. This one requires some dexterity and muscle power. And with Durga Puja just a week and some days away, its time to get cracking! In fact, I might just share a few more traditionally served recipes in the coming weeks – food made at home during the festival season, especially Bijoya. Learn with me and dazzle your guests with homemade food! And whilst doing that, don’t forget to flaunt on social media and tag From The Corner Table! You can find me on Facebook (click here), Instagram (click here), Pinterest (click here) and Bloglovin (click here). Crispy fried pastries dipped in cardamom-flavoured sugar syrup. Add cooking soda and ghee to the flour and mix for at least 5 to 7 minutes till the flour has a crumbly sand-like texture. Add half the water to the flour and knead well. You’ll need tight dough for the elo jhelo so add water gradually, with a teaspoon. Divide the dough into small lemon-sized balls. You should get around 18-20 balls. Place a ball on a clean, flat surface or a rolling board. With a rolling pin, roll the dough into a small disk. The thickness should be close to a chapatti or a crepe. Grab a sharp knife and make parallel slits on the disk, leaving one-finger gaps around the edges and little less between the slits. Now for the tricky part, the one where I had to do several retakes. The elo jhelo is kinda oblong or oval in shape. Keeping this in mind, gently pick up two opposite edges of the slit disk and roll it to the opposite side in an overlapping motion. Pinch together the ends. Heat oil in a deep pan or kadhai, keeping the heat on medium. Once the oil is hot enough, gently place the pastries into the oil, one at a time, and fry until golden brown and crispy. Remove on a paper towel to drain the excess oil and to cool. Bring water to a boil. Add sugar and cardamom powder. Stir occasionally, until the sugar has dissolved and the syrup has a thick, sticky texture. Gently add the fried elo jhelo into the sugar syrup, allowing the pastries to absorb the sugar syrup. But only for a few seconds. Remove, drain and place on a greased dish. Let the elo jhelo cool down before serving them. You can store these treats in an air tight container for nearly 10 days. If your dough is not tight enough, fret not. Take half a cup of all-purpose flour, add a teaspoon of ghee and knead as done earlier. Now gradually add this flour to the dough to get desired consistency. Health conscious? Replace the all-purpose flour with wheat flour. The method remains the same though your elo jhelo will be thicker and heavier. You can flavour the syrup any way you want! Replace cardamom powder with vanilla or even almond essence. If using essence, add it after you’ve removed the syrup from the flame. Previous How to Celebrate ‘World Vegetarian Day’? Next It’s Cake Stall Time Again!